Every year, I look forward to visiting Eli's Cheesecake headquarters, on the west side of the city. I've been going to their festival for years solely to take advantage of the great sales and discounts they have on cheesecake. I tend to stock up during the festival so that when the holidays come, I'll have cheesecakes for last minute desserts or even hostess gifts to give. I also liked watching the culinary demos that were available during the festival. They tend to feature local chefs from various outlets - restaurants, grocery stores, specialty gourmet shops, etc. Just as I do every year, I looked forward to visiting Eli's Cheesecake Festival. However this year was a bit different. Not only did I attend but I was a part of it! Eli's Cheesecake President, Marc Schulman is a social media buddy and we had the pleasure of meeting each other over the summer at the Taste of Chicago. Since then we've kept in touch. A couple of months ago, while he was in the planning stages of this year's Cheesecake Festival, Marc contacted me and asked if I would be interested in doing a culinary demo on stage. It was with great honor to be able to share what I do with patrons of this year's festival! I worked closely with Sarah, Eli's marketing manager during the weeks leading up to the festival and before I knew it, it was show time. I was the first culinary demo of the day so I had a lot of time to prepare, set up and get ready for my presentation. Upon arriving, the cooking tent was pretty much set up with chairs. The stage was fitted with all the main tools needed. There are really very little for me to do. I was given 45 minutes to do my culinary demo/presentation. Because I knew there would be limited resources on the stage itself, I prepared most of the dishes in advance. This allowed me to focus more on the audience and engaging with them, instead of fussing with actual cooking. Ground chicken can be pricey, because ultimately you're paying for the time and effort of someone else to process the chicken for you. If you have a food processor at home, you can buy sale cuts (such as chicken leg quarters, thighs, breasts, etc), de-bone them at home and process the meat in your food processor. Tip- freeze the de-boned chicken for 30 minutes to 1 hour prior to processing. This will help prevent your chicken from turning into a mushy paste and will help maintain a nice grind. If you're not too comfortable with handling raw chicken, especially when making meatballs, you can avoid forming meatballs by hand by using a scoop. They come in all sorts of sizes and using a scoop will help you have uniform meatballs. Also, the heat from your hands if you form meatballs by hand may affect the texture. This isn't an issue when you use a scoop! Apples are great on their own but when roasted, all the natural sugars have a chance to caramelize and adds a nice depth of flavor. I roasted a combination of Granny Smith and Jonagold apples, which were peeled and cored. After roasting, they were finely chopped up in a food processor and added to the ground chicken. The apples added a subtle sweetness that really complimented the chicken. Shredded cheese has been a major convenience item. However if you purchase a block of cheese and shred it yourself, you can save some money and even get more for what you do pay for. For these meatballs I used a combination of sharp and mild cheddar cheese. Apples go well with cheddar cheese and I figured adding just a bit to these meatballs will provide just enough flavor to meld with the chicken and apple. Place 2 lbs of ground chicken, 1 cup processed roasted apples and 1/2 cup shredded cheddar cheese in a bowl. Add to the bowl 1/2 cup dried breadcrumbs, 1/4 cup milk, 1/2 tablespoon of poultry seasoning and salt and pepper to taste. Carefully combine all the ingredients until fully incorporated. Form the meatballs with a scoop (or by hand if you'd like) and place on a cookie sheet. Another tip - instead of a cookie sheet, I used a mini muffin pan. It allowed each meatball to cook separately and evenly. Bake the meatballs in a 350 degree oven for 20-23 minutes until browned on one side. Remove and serve. You can serve the meatballs as an appetizer, in a bun for chicken meatball sandwich or even use the meatball mixture to fill mushroom caps for a flavorful stuffed mushroom! Roasting butternut squash is easy and so affordable, especially during the fall months when they are in season. Simply cut the butternut squash in half, scoop out the seeds, drizzle with olive oil and season with salt and pepper. Bake the squash in a baking dish at 350 degrees for 30-45 minutes, depending on the size of your squash. It may take longer but look for the squash to be soft enough to scoop out easily. Once you've scooped out all the flesh, process it in your food processor until smooth. Just as I did with the apples for the meatball dish I prepared, I did the same thing to pears. The pears were roasted also to add some sweetness to this puree. Any kind of firm pear would work nicely and you don't need to peel the pears. I kept the skin on but cored them before roasting. After they've roasted for 25-30 minutes, I processed them in a food processor and combined it with the butternut squash. To finish this dish, combine 2 cups of pureed butternut squash, 1/4 cup of pureed roasted pears, 1/4 cup chicken stock, 1/4 cup melted butter and salt & garlic powder to taste. Place in a baking dish and heat up to warm before serving. In a large bowl, combine the pumpkin pie filling, cream cheese and vanilla. Mix until fully incorporated and set aside. In a bowl of the stand mixer, place the heavy cream. Place in your stand mixer with the whisk attachment and whip until you have soft peaks. Carefully add the pumpkin cream cheese mixture with the whipped cream and fold in. Once fully incorporated, serve in a dessert dish and garnish with crumbled graham crackers. It's amazing how quickly 45 minutes goes by. 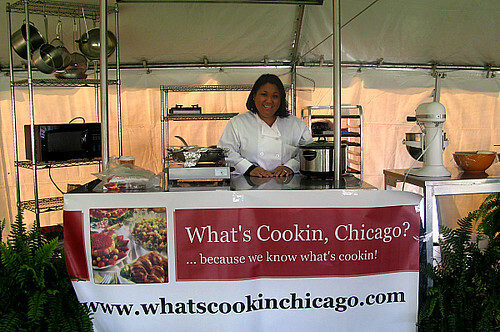 There was a lot of audience engagement, sharing of cooking and baking tips and informing the audience about What's Cookin, Chicago and my personal culinary journey over the years. It was a great time and if you have the opportunity of being in Chicago during Eli's Cheesecake Festival, I highly recommend it... and I just might even see you there in future years! OMG Joelen - that's so cool that you got to do a demo at the festival! Congrats! Congratulations on being part of the festival. Those meatballs look yummy! congrats on the wonderful opportunity! Your recipes sound delicious . Wow Joelen! Congrats on having the opportunity to do a culinary demo - that is so awesome!! Everything looks/sounds delicious! What a great opportunity for you! Hope you enjoyed the cooking demo. Those meatballs look so good - and thanks for the tip on how to grind raw chicken. That is so awesome that you got to do a demo! You look so cute in your pic on stage! Everything sounds so delicious! Especially the meatballs, I never would've thought to bake them in a mini muffin pan. Great tip! Thanks for sharing.